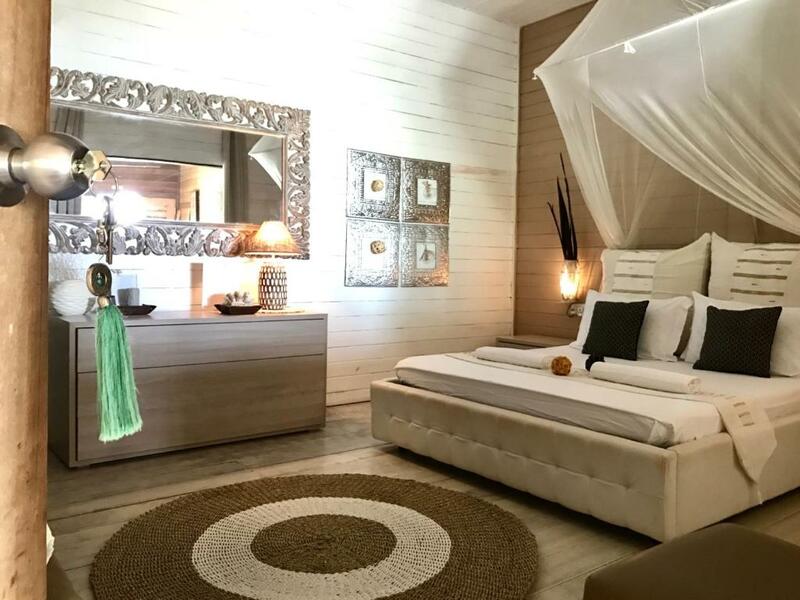 Lock in a great price for Samura Maldives Guest House Thulusdhoo – rated 9.6 by recent guests! Samura was a very nice and beautiful place. The room was well decorated, clean, and spacious. The meals at Samura were good. You get free pizza every evening and the breakfast is also well served. We had a dinner there and it was big portion with various menu and very tasty! We visited Ashdu sandbank and had a turtle tour while we stayed in Thulusdoo. Ashdu sandbank is one of our favorite trips. Also, on the way there, we saw dolphines swimming and spinning in the Ocean. That was very cool! What we loved the most was the owners and staff at Samura were very kind and accommodating. We would love to stay at Samura again if we visit Thulusdoo next time. Very friendly and family environment, with excellent food and a beautiful area. Extremely relaxing and worth. Close to two famous surfing spots (cokes and chickens). Very pleasant customer service and lovely food. Instant help. Very beautiful beachfront area, just gorgeous...from the first and to the last day you feel like being in a tropical paradise. 5 stars especially to Giacomo,the host, we enjoyed an excellent hospitality from you and working staff. Great ocean view from the rooms, excellent waves and there is possible to start snorkling already in front of Samura beach front area. Amazing place right in front of the beach, between coc's and chiken's surf point. The ouner is italian, so nice and warm will do anything to make his Guests happy and satisfied. They help you with the speedboat from the air port to the island, rooms are amazing and clean with ocean view feels like in a dream. Great dinner and breakfast. Loved that the room was literally in the sand and the staff was really nice and available for anything you need. Perfect location, on the beach. Amazing staff, they treat the guests as family. Great decoration of the space, great atmosphere all around. Totally recommend. Great and helpful owner and staff. Amazing beachfront location. Every day around 6:00 pm is served homemade pizza and drinks for free. Place is amazing . One can spend days in the hotel premises. Beach was right in front of the room, ours was sea view room. Host and staff is the best part of the hotel. They are very courteous always for guest. Felt like home here. Excursion offered by hotel was great, we snorkelled around a desert sand bank. Overall loved the whole experience would recommend this place to all. One of our best sellers in Thulusdhoo! Featuring free WiFi, Samura Maldives Guest House Thulusdhoo offers beachfront accommodations in Thulusdhoo. 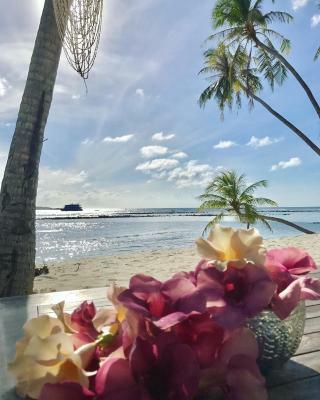 The bed and breakfast has a private beach area and water sports facilities, and guests can enjoy a meal at the restaurant. Free private parking is available on site. Each room has a private bathroom equipped with a shower. You can engage in various activities, such as snorkeling and windsurfing. The nearest airport is Male International Airport, 16 mi from the property. This property also has one of the top-rated locations in Thulusdhoo! Guests are happier about it compared to other properties in the area. This property is also rated for the best value in Thulusdhoo! Guests are getting more for their money when compared to other properties in this city. When would you like to stay at Samura Maldives Guest House Thulusdhoo? This double room has air conditioning, sofa and sea view. 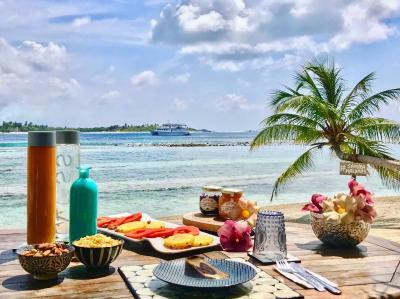 House Rules Samura Maldives Guest House Thulusdhoo takes special requests – add in the next step! One child under 6 years is charged USD 30 per night when using existing beds. Any additional older children or adults are charged USD 85 per night for extra beds. Samura Maldives Guest House Thulusdhoo accepts these cards and reserves the right to temporarily hold an amount prior to arrival. WIFI should be better. Food is not of a big variety, but I guess it is quite common in this part of the world. It seems food is not just as important. Also make sure you bring your favorite snack and all the things you need as local groceries offer very limited items. Also, there is no alcohol neither in this place, nor whole island. Prepare for that. Best thing about this place is how the room and garden are decorated, and definitely staff. I think that in terms of meal offering is a bit limited because you allways have to reserve your meal and you have to eat what’s available. It’s the only downside of the place. Everything else is wonderful! 1. THE PEOPLE! Everyone was so amazing. They were always smiling and super nice. We feel very welcomed. The owner and the staff was very friendly and attentive to guest needs. Their level of service were beyond our expectation. It was superb! 2. The ocean view from our room was amazing. The room was exactly like the photos shown here or maybe even better. Everything looks just so gorgeous and it feels so wonderful. 3. Samura has the most beautiful beachfront area compared to other guesthouses or hotels we've seen in Thulusdhoo. 4. The excursion to the sandbank was one of the highlights during our stay in Samura. We were brought to the Infinity Sandbank and it was stunning. We wish we could have stayed longer but the weather wasn't so good so we had to leave earlier. 5. We were fortunate to have seen dolphins during breakfast. One of the staff, Nur point it out to us and he was kind enough to bring a binocular so we could further enjoy watching the dolphins. 6. We love the free pizza every evening. There's one time when we were in our room, one of the staff, Hasan sent us the pizza. It was a very kind gesture which had really touched our hearts. 7. Another highlights was during my birthday. The team had helped my husband to prepare a lovely surprise dinner which was so romantic. I was surprised when Giacomo himself came to our dinner table with his team and sang the birthday song. It makes the evening even more special. 8. Watching beautiful sunrise from just in front of our room. 9. The overall ambience of the guesthouse. It was very calming and relaxing. I would highly recommend this place. We went to a different island in Maldives and had stayed at a hotel with a similar room rate with Samura but the standard that this place had offered was way beyond the other hotel we stayed. We hope Giacomo and his team will continue to put their customers first. They certainly are the most hardworking host we've ever met. The bathroom needs some work. Our room didn't have much light, natural or artificial. Breakfast was not very varied. Breakfast could be better. Every day the same: fruit/papaya and pineapple/, sweet cake, toasts and eggs/fried, scrambled. In the room was heard everything that was going on around, so if you are on a honeymoon/ if you are travelling with a partner/ you will not enjoy much if you do not want the half of the guesthouse to hear you :-D Lunch costs 15 EUR and dinner 18 EUR, which is relatively expensive compared to the surrounding area. The guesthouse does not accept credit cards. to be picky with just one comment, the food was not so varied.. it is great when it’s maldivian and not only italian oriented for example.. and the dinner time can be a bit late for a baby or/and a surfer..
Samura is absolutely exceptional!! we traveled to surf with a 7-months old baby and stayed in samura for two weeks. The location is perfect with the nicest view and piece of beach, a few steps away from everything important. We spent the vacations with feet in the sand, including at breakfasts and dinners. The service was staff is incredibly nice, we miss them now... we would stay there again in a heartbeat!! and actually hope we will!!!!! Great staff, delicious food, awesome location. We felt like at home in this distant part of the world. 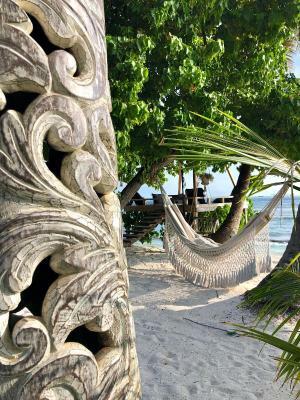 Beautiful Guesthouse right in front of the beach with white sand and turquoise waters! We had such a great time for our Honey Moon and we strongly recommend this place! Rooms are spacious with stylish and modern designs; wonderful breakfast the feet in the sand; a unique and perfect place to relax and enjoy the real Maldives! A special thanks to Giacomo and the whole team for their warm welcome and all their friendliness! 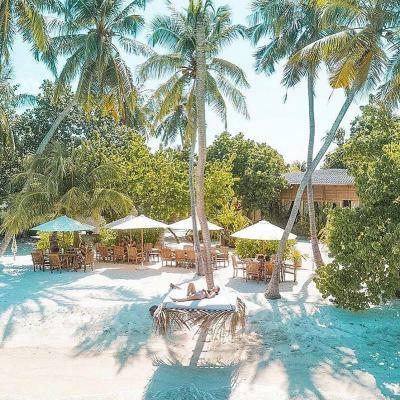 We strongly recommend Samura Maldives and will be back soon! EVERYTHING!!! Samura has exceeded my expectations. It was such a great find. 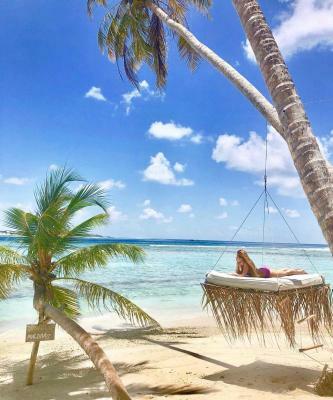 It is right on the beach, very beautiful and very well decorated with so many cool things like a hanging bed, beach beds and hammocks to chill and relax. 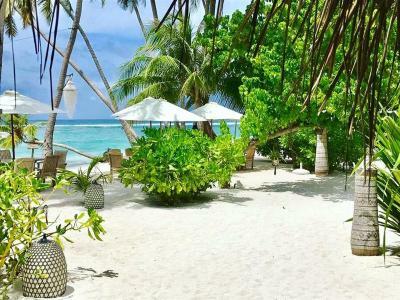 The owners are super nice, very warm and welcoming and it really feels like a family and you are at home in the Maldives. It is very safe and great for the kids, my usually pretty shy 5 year old was running around carefree. Our room was fantastic, it was right on the beach, I could watch the gorgeous Maldivian sunrises right from my bed. It is very reasonably priced too. Really fantastic holiday. Thank you so much, Samura!!! One thing to remember when you stay at Samura is that they take usd and mvr, but no credit cards. Mattress very stiff and transportation is complicated as there are not so many boats, unless you pay a high price. However, this is a problem of Maldives, and not specifically from Thulusdhoo.